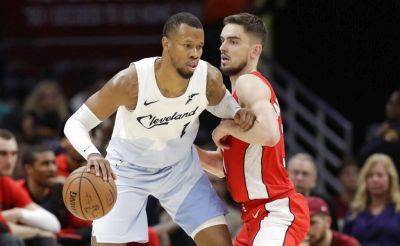 CLEVELAND — Jordan Clarkson scored 28 points, Cedi Osman had 26 and the Cleveland Cavaliers held off Washington’s fourth-quarter comeback to beat the Wizards 116-113 on Tuesday night. Cleveland matched a season high with 15 3-pointers and built a 25-point lead in the fourth before Washington’s reserves roared back. The Wizards reduced the lead to 119-109 with two minutes left and took advantage of Cleveland’s poor free throw shooting to get closer. Jordan McRae’s two foul shots with 18 seconds remaining cut the margin to three. Osman missed two free throws with 11 seconds left and the Wizards called a timeout to set up chance to tie the game. Osman stripped the ball from Tony Brown Jr. at the 3-point line and Larry Nance Jr. dribbled out the clock. Cleveland made seven of 16 free throws in the fourth. Trevor Ariza had 13 points, but Washington’s starters spent most of the fourth quarter on the bench. McRae scored 15 points and Gary Payton II had 11 — all in the final quarter. The early minutes of the fourth became a festival of dunks and 3-pointers for the Cavaliers, who led 105-80 midway through the period. Cleveland broke a 36-all tie late in the second quarter and led 53-47 at halftime. Osman helped build the margin in the third with 11 points, including three 3-pointers. Cavaliers: Had six players in doubles figures. Collin Sexton scored 12 points and Matthew Dellavedova added 10. … Sexton fouled Beal while the Wizards guard was hitting a 3 in the first quarter. Beal completed the four-point play at the line. … Osman was selected to the World Team for the Rising Stars game that will take place during All-Star weekend.